Let’s start with how you can bring the glitters on your nails. So these come out of this bottle, but the whole is a bit to big. A smaller one would be much better, because now it’s hard to dose the glitters and you will spill some of them for sure. So you best can bring the glitters on your nails above a paper, because that way you can easy put the spill glitters back in the bottle. So for bringing the glitter on your nails, the nail polish has to be a bit sticky, so not whole dry. You can bring on as much glitters as you want, and you can carefully push on them a bit. When it is dry, it’s time to work it off with a good topcoat. This is rock in a bottle, a very good name for these chunky but tough silver glitters. I really love how these look, and these are perfect for a detail nail. Some of the glitter piece stab a bit out, so this gives it for sure that tough look. 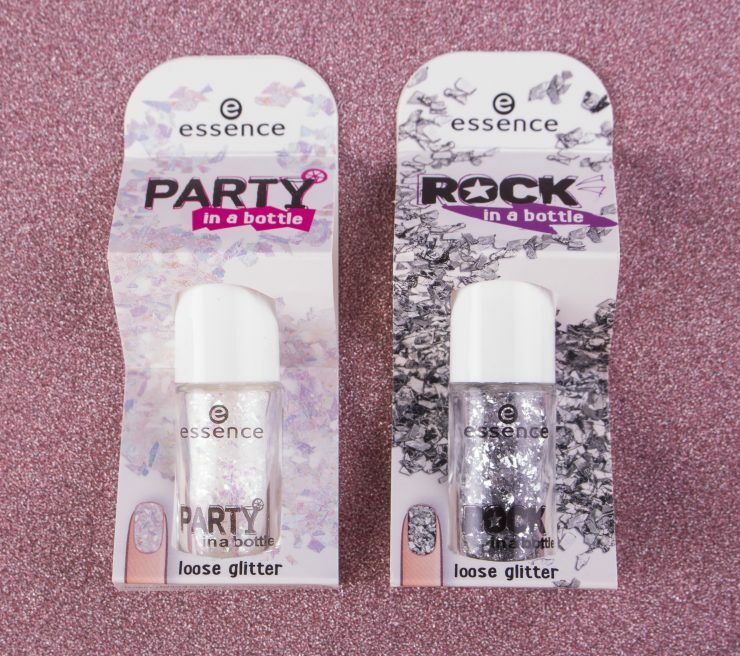 Party in a bottle are more magical glitters. I would describe these as unicorn glitters. These are holographic, so the look of them change, it’s just magical like a unicorn. 😉 I really love these glitter from essence! With only one glitter nail you can make your nails look magical! These nail glitters are just the bomb! They look so cool and pretty and give your manicure that special effect. To bring the glitters on is a bit harder. But as you see, difficult is also possible. And if you lay a piece of paper under it, you can easy do the spill glitters back in the bottle. And for that price are these for sure the bomb and worth it to try out! You can do a detail nail so just one or for a real statement you can do all of them! Oeh dat ziet er wel heel tof uit! Ja ze zijn echt geweldig!